Head west from Mauville City. You'll spot a building with a man outside, and behind, lots of Pokemon. This is the daycare centre where you can send two of your Pokemon to gain some levels. However, if the two are in the same egg group, they may also produce an egg. Continue west - there's a Revive behind the Cut bush, a Great Ball beyond the patch of flowers, and a hidden Repel near there. When you reach Verdanturf Town, go to the red contest house and pick up a Contest Pass - this allows you to participate in any contest around Hoenn. The lady in the top right corner will also give you TM45 - Attract. Next, enter the cave to the left of the PokeMart. Head out the exit to the left and talk to the man there - he's dropped his glasses. Search two squares to the left of him and you'll pick up Blackglasses. Talk to him again and he'll leave. There's an HP Up on the rocky ledge. Back inside Rusturf Tunnel, grab the Max Ether at the top of the cave, and proceed to use Rock Smash on the rocks where the two people are standing. You'll be rewarded with HM04 - Strength. 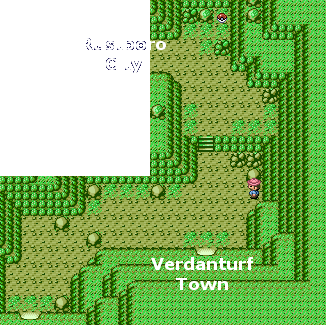 Moreover, you can now freely go from Verdanturf Town to Rustboro City - the Devon Worker is waiting on the Rustboro side of the tunnel to give you a Repeat Ball. Return to Mauville City when you're done. Head north from Mauville City. You'll spot a house with a man standing outside of it - this is the Winstrate family. As the name suggests (Win straight, har har), you have to win 4 consecutive battles and you'll earn a Macho Brace from the family when you talk to the lady. Afterwards, proceed north, using Rock Smash on the two boulders there. You'll see a desert with a sandstorm brewing - you won't be able to pass without Go-Googles. Head west from the desert. You'll see two Aqua/Magma Grunts blocking the entrance to a cable car, so you'll have to go through the Fiery Path just to the left of that. There's a boulder that you can use Strength on, but you won't be able to as you don't have Lavaridge's Heat Badge. Follow the path out (you'll see another entrance into the desert on the way) until you meet a boy staring at a tree. Talk to him, and you'll get TM43 - Secret Power, which can be used to make your very own Secret Base. See the Secret Base Guide for more information. Further on, a lady will give you a berry, and there's a rest stop to heal up before continuing west onto Fallarbor Town. You'll reach an area where ash is falling from the sky. Continue onwards until you reach a house. Go inside and grab a Soot Sack from the man. Collect soot by walking around the grass; when you have collected enough soot, you can return to the man and he'll make special Glass items for you. There is a hidden Ether, a Super Repel and a Max Ether along the way. There's also TM32 - Double Team hidden in a small mound of ash just west of the Glass Workshop. Check out the Fallarbor PokeCenter. Talk to the girl standing by the PC - that's Lanette, the inventor of the Hoenn Pokemon Storage System. There's also a contest house in Fallarbor Town, but unique to here is the Move Tutor's place. The Move Tutor teaches Pokemon naturally learnt moves they have previously forgotten for one Heart Scale. And if you're strapped for cash, check out the crater in the middle of town for a hidden Nugget. Visit the first house you come to after heading west from Fallarbor - this is the Fossil Maniac's house. If you talk to the little girl by the hole, she'll give you TM28 - Dig. This is a very important move that you should NOT delete as it is needed to complete the Regi sidequest. Continuing on, a man near the house will give you TM05 - Roar. Head south, and the building there is Lanette's House. She'll give you a Lotad Doll (If you're playing Sapphire) or a Seedot Doll (If you're playing Ruby). The lady outside will also give you a Nanab Berry. Head up the rocky ledge to the left (The item behind the Rock Smash boulder is a Protein) and follow the path into the entrance of Meteor Falls. Head straight up the stairs for a Full Heal, then across the bridge to proceed with the storyline. You'll see Team Aqua/Magma cornering Professor Cozmo for the Meteorite, but their rivals (Magma is Sapphire, Aqua in Ruby) will show up and chase them off. Talk to Cozmo, then pick up an important Moon Stone to the left. Exit to the south. There's a Great Ball here, and if you head further south you'll reach Rustboro City. 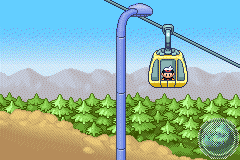 Head back to the Fiery Path (North of Mauville City), but this time round, the cable car that was previously blocked should now be accessible. Ride it to the top of the mountain. You'll see all these Magma and Aqua Members fighting it out with their Poochyena. Head to the northwest corner of the crater where Archie/Maxie is trying to use the Meteorite to manipulate the volcano. You'll have to beat two of their minions before facing off against the leaders - both are quite easy, but Archie/Maxie might be a bit tough - they each a lv24 Mightyena, lv24 Golbat and Archie has a lv25 Sharpedo, while Maxie has a lv25 Camerupt. Be on guard, they'll use Super Potions for recovery. The opposition leader will thank you for your efforts once the battle is over, and you're free to wander around. Inspect the weird machine and choose to take the Meteorite. There's nothing else to do here, so head down the stairs by the cable car that was previously blocked. The small stones around the place can actually be bounced on by the Acro Bike, so you can climb up ledges that you've jumped down. There's a Burn Heal on the far right of the path, otherwise nothing much else to get. The exit at the south leads straight to Lavaridge Town. The lady standing by the hot springs will give you a Wynaut Egg if you talk to her. The house to the right of the gym is the Lavaridge Herb Shop, so take a look around - the old man standing around will give you a free Charcoal if you talk to him. You can sit in the hot springs for no apparent reason if you want to, otherwise head to the gym for your fourth badge. Navigating your way around the gym might be a bit tough, so here's a map for your convenience. Just follow the numbers and you'll reach Flannery. The section on the left is the top level; the one of the right is the basement. Flannery's Pokemon aren't that tough, but watch out for Overheat which will be dealing out a lot of damage. Grass, Bug and Steel Pokemon are weak to Fire, while Water, Rock and Ground are super-effective against them. Watch out for Torkoal's White Smoke which prevents stat loss. When you defeat Flannery, she'll give you the Heat Badge which makes all lv50 Pokemon and below obey you, and allows you to use HM04 - Strength outside of battle. You'll also receive TM50 - Overheat, which deals a lot of damage, but lowers your own Special Attack.